By Will Jennings and Gerry Stoker. Will Jennings is Professor of Political Science and Public Policy at University of Southampton (Academia.edu, Twitter) and Gerry Stoker is Professor of Governance at University of Southampton (Twitter). You can read more posts by Will Jennings here and more posts by Gerry Stoker here. Some argue that the current anti-politics mood is just a contemporary manifestation of a timeless phenomenon: that people don’t much like politics or politicians. It probably true that politicians have never been greatly popular in the history of British democracy but there is now clear evidence of decline and more than that it appears that anti-politics is having a big effect on politics by driving support for UKIP. Good longitudinal data on public attitudes towards politics and politicians is difficult to come by. To address this, we have replicated a poll question that was first asked by Gallup in July 1944: “Do you think that British politicians are out merely for themselves, for their party, or to do their best for their country?” To mark the 70th anniversary of the original poll, and the launch of a new ESRC project that looks at popular understandings of politics between 1937 and 2014, YouGov carried out a survey for us asking precisely the same question as was asked to the British public in 1944 and 1972. The results (see Figure 1) show that there has been a clear shift in public attitudes seeing politicians as self-serving, with some 48% of respondents now considering that they are ‘out for themselves’, a further 30% believing they are out for their party, and just 10% thinking they want to do what is right for the country. The fact that only 1 in 10 of us think politicians try to their best for the country now represents a large drop, both from the wartime poll (where 36% were willing to see politicians as trying to do their best for the country) and from the 1970s poll (where 28% felt that politicians were out to do their best for us). The data tells us that people are noticeably more negative about politics today than they were seventy years ago. 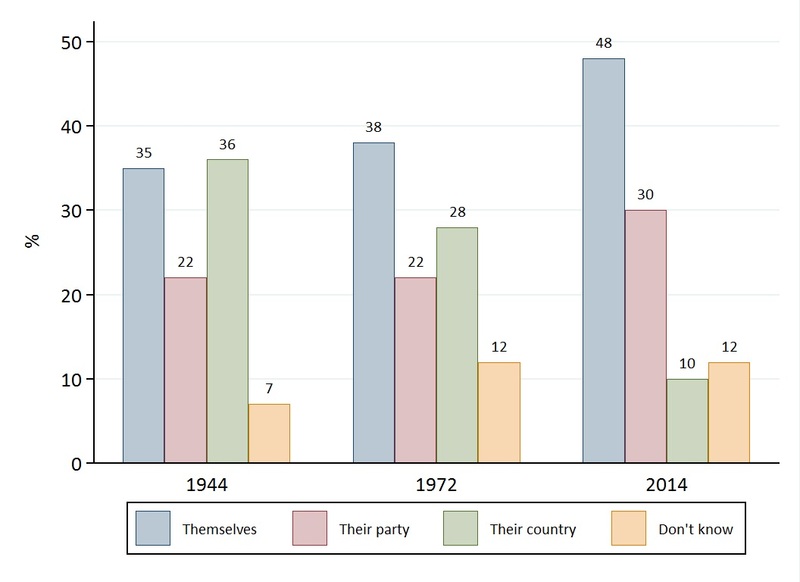 Indeed, the fact that public opinion moved only slightly between 1944 and 1972 but much more negatively since then indicates that recent disenchantment with politics is an issue that is of serious consequence. Figure 1. What Motivates Politicians? It is also clear from our data that disaffection with politics and politicians is fuelling the drift of voters away from the main parties to UKIP. UKIP voters are steadfastly negative about the political class. Some 74% of them believe that politicians are out for themselves and 19% for their party, with a paltry 3% thinking they are out to do their best for their country. This view of self-serving politicians is the unifying feature of attitudes of UKIP supporters. Arguably political disaffection unifies UKIP supporters at least as much as either opposition to the EU or concern about immigration. If we model the likelihood of voting UKIP as a function of those answering that politicians are out for ‘themselves’, as much variance is explained as typical social predictors of UKIP support (those predictors in our dataset being respondents who are male, over-54 and working class). UKIP voters are not necessarily the ‘left behind’, but are people holding unambiguously and intensely negative views of politics and politicians. UKIP supporters are also much more firm-minded on this issue, with just 4% indicating ‘don’t know’ (a much lower figure than the average of 12% for the other parties). Not only are UKIP supporters more negative, they are surer of their views. They “know” that establishment politicians are serving themselves or their parties not the country. Another notable finding, given the conventional wisdom about anti-politics, is that younger respondents (18-24) are in fact much less likely to think politicians are out for themselves. This is despite the popular claim that young voters are unengaged. It is older voters who are more cynical about the motivations of politicians. So the decline in citizens’ willingness to back politicians to do the right thing by their country cannot easily be explained by a generational shift to more challenging, critical or cynical voters. It has got something to do with citizens’ judgement about how politicians and politics are presented and appear to them. In that light it is worth noting that if your party is in power you might be more willing to give its politicians the benefit of the doubt. In our results, Conservative voters are most positive, with ‘just’ 34% thinking politicians are out for themselves, while 21% think they are out for their country (more than double the average). Curiously, Lib Dem voters tend not to think politicians are out for themselves (just 26% do), but 44% think they are out to do what is best for their party. This is perhaps a function of the party being in a coalition as well as the fact that Lib Dem voters are now something of a rump. Despite much celebration of the quality of Scotland’s democratic debate over independence, respondents from Scotland are more likely to see politicians as being self-serving than any other part of the country (with London and the South being more positive than the rest of the country). Finally let us return to the original 1944 Gallup results. Remarkably, as war continued to rage across the globe, some 35% of respondents still believed that Britain’s politicians were out for themselves, 22% for their party, and 36% for their country. A healthy scepticism appears to have been ingrained in British citizens for a long time and will never be rooted out. But with only 10% of citizens now thinking that politicians try to act in the public interest it suggests that governing in a time of real crisis would be even more difficult. And those crises are potentially upon us, whether they are forging economic recovery, dealing with global warming or funding health care for an aging population. As David Runciman argues in his historical review The Confidence Trap, democracies have muddled through crises in the past but they may be losing the capacity to do so in the future. Our survey findings should give further reason for sounding alarm bells: if no one believes in elected politicians our ability to take effective collective action on issues that matter may be diminishing or disappearing. Technical note: Total sample size was 2,103 adults. Fieldwork was undertaken between 20th – 21st October 2014. The survey was carried out online. Figures have been weighted and are representative of all GB adults (aged 18+). Full cross-tabs of the survey can be found here. Details of the logistic regression of UKIP vote intention comparing the effects of social predictors with political disaffection can be found here.